Nothing comes between me and my strip quilt. On this day in 1913, a New York socialite named Mary Phelps Jacob received a patent for her invention of the modern brassiere, a streamlined alternative to the unhealthy and painful corset. The quilt was documented as part of the Michigan Quilt Project by the family member who inherited it. Treasure from the trash: Wisconsin scores! On this day in 1848, Wisconsin entered the union as the 30th state. The territory had passed from French to British to American control starting in 1634, when the area was a major center of fur trade. Wisconsin citizens finally approved statehood so they could gain from federal programs that were helping neighboring Midwestern to prosper. This Mexican Rose Variation quilt was made by an unknown quilter around 1870 in Wisconsin. According to the Quilt Index record: “It was donated to the Wisconsin Museum of Quilts and Fiber Arts by Nancy Stecker. Her husband found it inside a trunk he took from the Town of Cedarburg Dump in the 1970s. The appliqued border on this quilt is very similar to the border on the other quilt found in the trunk.” It was documented by the museum during the Wisconsin Quilt History Project in 2009. On this day in 1937, the German government, then under control of Adolf Hitler, formed a new state-owned automobile company. The original name was Gesellschaft zur Vorbereitung des Deutschen Volkswagens mbH, but the company was renamed that same year simply Volkswagenwerk, that translates to “The People’s Care Company.” Ferdinand Porsche of Austria was called in by Hitler to build an affordable, fun car (sales price was about $140 in U.S. currency at the time). The German government sold 60% of Volkswagen stock to the public in 1960. 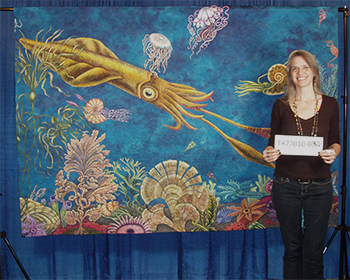 The quilt was documented as part of the Michigan Quilt Project. As I search and browse The Quilt Index for quilts and stories to feature here, I so often come across records that mention soldiers, nurses and others serving in foreign and domestic services. Quilts made by family members to comfort their loved ones (and strangers) during or after battle, quilts made to honor noted countrymen and women who served, quilts made by tailors from uniform scraps, and sometimes even quilts made by someone who served themselves, are documented in this database of more than 54,000 quilts. The quilts I’ve chosen to share below are from ten different Quilt Index contributors, including museums, state documentation projects and organizations, who documented and preserved the history of the quilt, the quiltmaker and the story of the quilt for this and future generations. Click on the images to visit The Quilt Index and view the basic record page for each quilt. To see the full information available for each record click on the [See Full Record] link at the bottom of the basic record page. It is amazing all that she accomplished for our country. Establishing a public school; “Angel of the Battlefield” during the Civil War; spent four years to identify over 22,000 missing soldiers; established the American Red Cross and served as president for 23 years; at 83, president of National First Aid Association. She certainly patched many lives together! Her work was not considered women’s work and never had the right to vote. Clara died in 1912. Donor History: Wool quilt pieced from tailor Barnette Kobler’s scrap box by his wife, Elizabeth Kobler, circa 1778. Barnette Kobler tailored Revolutionary War soldiers’ uniforms. Barnette Kobler had his tailor shop in Harper’s Ferry, West Virginia from 1774 to 1777. Barnette Kobler’s parents died in an Indian raid. Barnette Kobler, along with four of his siblings survived the attack and was taken into the care of his neighbors. Since his guardians were tailors, Barnette became apprenticed to the tailor trade. Inscription: “Freedom from Fear, Freedom of Worship, Freedom from Want, Freedom of Speech.” Handmade during World War II. Appliqued Minute Man soldier in center, surrounded by hand-pieced 5-pointed stars. Top pieced by the wife of a veteran of Sherman’s March. Made for a soldier in hopes of his safe return to Pennsylvania from the Civil War. The color represented the colors of the North and South. This quilt (and Rocky Mountain Rail Road) made for Nan Kinkead’s dowry/hope chest when she came home from college, Holston Conference Female College for Women, Asheville, North Carolina, 1856. The feathered star was loaned to a young confederate soldier during the Civil War, when he hid out in a cave in back of the house. The farm was called Cave Hill Farm because of the cave there. The quilt was found some years after the war in the cave, stuck in a wall nook. Made for Harmon’s great-great-great grandfather James George, a soldier in U.S. Army, Civil War; “H” company, NY Infantry volunteers. Levi made the quilt when he was about 15 years old. He was awarded Distinguished Service Cross in WW I where he was killed in action. Made for brother, William Daniel Ayers (Friar Hills, Greenbrier County, WV); died in 1927. Given to his daughter Kate Ayers McMilion, until 1936. Given to Ina McMillion Montgomery, daughter of Kate. William was a Confederate soldier. Project Name: Wyoming Quilt Project, Inc.
Handwritten names of persons who served or raised funds for Spanish American War. stripes of the quilt Names on red stripes are not legible. Names included here are written on the white stripes. Made other quilts; Children: One child was named Christian Orella; Squares were given by friends and quilted when soldiers returned; Quilting was followed by a dance that night. View all of these quilts on The Quilt Index to read more about it’s history, design and construction. Be sure to use the zoom tool for a detailed view. Please help us spread the word about the Quilt Index to everyone you know who loves/makes/owns/collects/studies quilts and history. Wishing you all a nice Memorial Day! 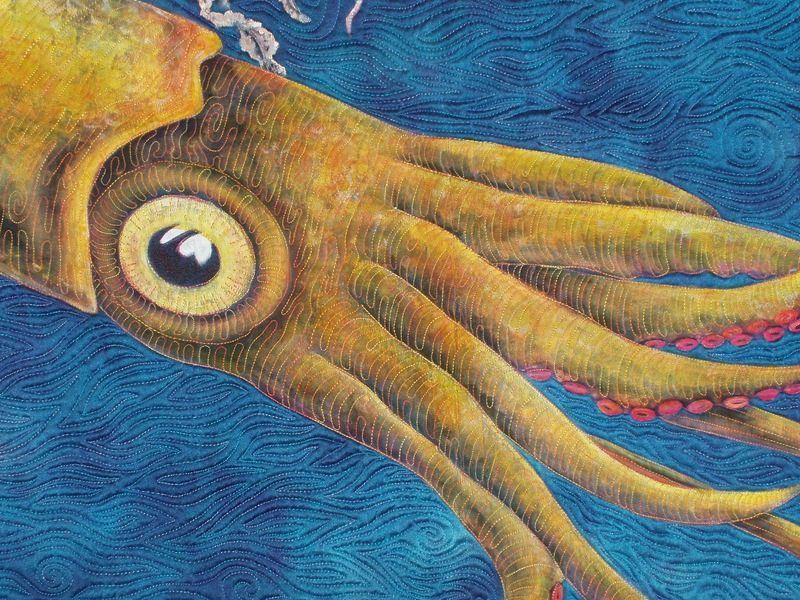 “This quilt is ‘Primordial Sea’ and I made it in 2005 after living in Texas. We lived in Austin, Texas for seven years and while we were there my son became obsessed with fossils. We spent a lot of time looking around in the creek beds of Austin [Texas.] collecting fossils and it led to many discussions about the geological history of Texas and how it used to be underwater and why there were seashells in the middle of Texas. CC: Aside from the quilting community that you’re in, is there any particular way that you think that where you have lived has influenced the way that you quilt? You can read more stories from the International Quilt Festival (and hundreds of other locations!) at the Quilters’ S.O.S.- Save Our Stories page on the Alliance’s site. On this day in 1991, “Thelma and Louise” debuted in movie theaters. In this reworked version of the typically male-dominated road trip movie, heroines Thelma and Louise drive a 1966 green Ford Thunderbird convertible in the climactic final scene (about which I will not tell you, just in case you haven’t seen it, but the quilter I’m going to tell you about next has a clue in her last name). Thelma Radcliff, a retired occupational therapist from Troy, West Virginia, made this cheerful Monkey Wrench quilt in 1940. It was machine and hand pieced and machine quilted with scraps and new fabrics. The well-used quilt was documented by the maker during the West Virginia Heritage Quilt Search in 1992.